Troutdale, Or. : Newsage Press. Near Fine. 1997. First Edition. Softcover. 0939165317 . Excellent condition - clean and unmarked. Cover has slight wear at corners and old price sticker on rear. B/w photos. 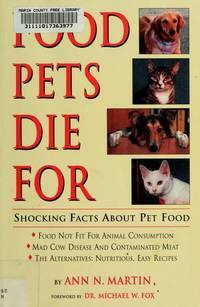 ; 8vo 8" - 9" tall; 145 pages; Food Pets Die for: Shocking Facts About Pet Food by Ann N. Martin was the first expose of the shocking practices within the pet food manufacturing industry. Since the book's publication in 1997, she has been calling attention to the dubious ingredients and methods employed by many firms. Martin continues to put pressure on the big companies to find alternatives. She suggests that if acceptable commercially prepared food is not available, food can be made at home using safe and human-quality ingredients, and she provides recipes and suggestions for supplements. (245os,0514) . Gotham. New. 2005. First Edition. Softcover. 1592401325 . New book - has reminder mark across spine end on bottom. Very light shelfwear to cover edges. 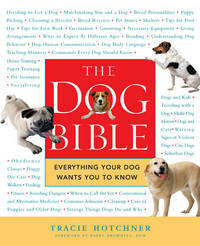 ; Large 8vo 9" - 10" tall; 704 pages; For everyone who has ever wished Dr. Spock had written about dogs insteadThe Dog Bible is your essential guide to everything you will ever need to know. 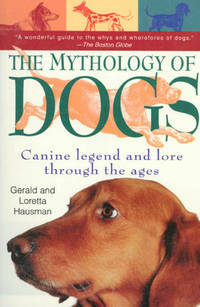 Whether youre a first-time dog owner or an expert, your dog would want you to read this book. Encyclopedic in scope, it covers not only the basics, but every practical aspect of life with a dog, including many fascinating and helpful subjects never before collected in one volume.... (*Note: due to heavy weight, extra shipping will apply) (1+kg) . By Dorosz, Edmund R. , B. S. A. , D. V.m. AB: Our Pets' Inc.. Good. 1993. First Edition. Softcover. 0969688407 . Signed and dated by author on first endpage. Interior clean and intact, couple tiny edge tears seen, b/w & colour illustrations. Cover has some curling at corners, small chip out of one corner, scuffing and light edge wear, a little spotting to outer edge of pages. Covers dog nutrition, proteins and fats, vitamins, diets, commercial dog foods, diseases, various types of recipes for homemade dog food and other topics. (525) ; 8vo 8" - 9" tall; 256 pages; Signed by Author . Renaissance Books. Very Good+. 2001. First Edition. Softcover. 1580632017 . Book is actually new but has a bit of a messy remainder mark on bottom edge so some of the black marking can be seen on bottom end of front & back cover. Otherwise as new. ; 8vo 8" - 9" tall; 360 pages . David & Charles Publishers. Very Good. 2003. First Edition. Softcover. 0715315757 . Ex-library book, but still in great condition. Sturdy laminated cover and usual ex-lib type markings. Pages clean and tight other than small light edge stain near rear. Cover has a little scuffing and very light edgewear. B/w illustrations. 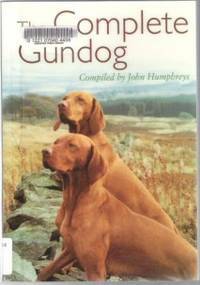 Humphreys and a team of 13 experts offer sound advice on all aspects of gundog training and care. ; Large 8vo 9" - 10" tall; 224 pages . Rodale Books. New. 2006. First Edition. Softcover. 1594860815 . New book, tiny remainder mark (a dot) bottom edge, a little bumping to one upper corner. 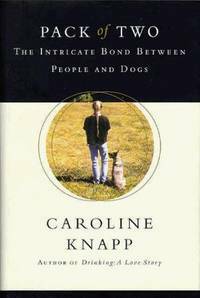 ; 8vo 8" - 9" tall; 224 pages; Dog owners learn how to apply successful child-rearing methods to parenting their pups-and turn their dogs into loving and responsible members of the familyFor most dog owners, a dog isn't just a pet but a beloved family member. That's why two internationally known parenting experts have teamed up with an acclaimed animal behaviorist to produce Pup Parenting. 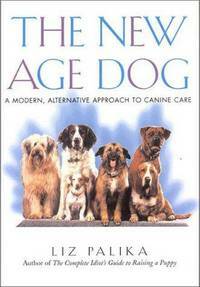 This one-of-a-kind guide-which takes effective child-rearing methods and modifies them to work with the canine set-represents an exciting breakthrough in dog discipline. 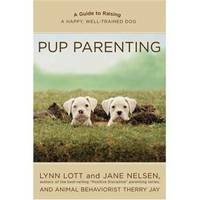 Pup Parenting:  helps people choose a breed that fits their family provides a simple test to assess a pup's personality presents an easy 5-step plan to bring straying behavior problems smartly to heel. With a firm, positive approach that rejects both the alpha discipline method and the overindulgent reward-based system, Pup Parenting is a companion readers can refer to throughout all doggie life stages. [332-osl] . Winchester Press. Good+ in Good+ dust jacket. 1972. Hardcover. 0876910819 . Ex-library book with usual ex-lib type markings. Internal pages are tight, with occasional light soiling, light stain edge of endpage. Moderate soiling to outer edge of pages. Jacket has light scuffing, light edgewear and a couple tiny tears spine top. ; 8vo 8" - 9" tall; 182 pages . St. Martin's Griffin. Near Fine. 1998. First Edition. Softcover. 0312181396 . Very nice condition, clean and unmarked. Light edge and corner wear to cover. ; 8vo 8" - 9" tall; Tracing the literary and historical legacy of over 65 different breeds, "A magnificent, breed-by-breed collection of the legend and lore surrounding man's best friend. From the Afghan to the Yorkie, fascinating stories abount, including: The Maltese who hid under the skirt of Mary Queen of Scots at her beheading; The medieval Wolfound who bravely saved his master's child from a marauding wolf; The Afghan whose nose got wet plugging up the holes in Noah's Ark; The Newfoundland who valiently tried to save his owner as the Titanic went down etc. Etc. [415-notosl] . T. F. H. Publications. Very Good. 1997. Softcover. Creasing to covers, light edgewear/rubbing. Internal pages clean, no markings. Colour photos. 224 pages. Sensible, easy-to-follow recommendations about selecting and caring for a Rottweiler. 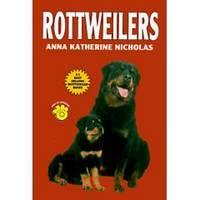 #1 rated best selling Rottweiler book. (400osl? ) ; 8vo 8" - 9" tall . By Mordecai Siegal & Matthew Margolis "uncle Matty"
Fireside Books. New. 2001. First Edition. Softcover. 0684864738 . New book with small remainder mark to top or bottom edge of pages. May have slight shelfwear to cover edges. ; 8vo 8" - 9" tall; * Does your puppy chew everything in sight? 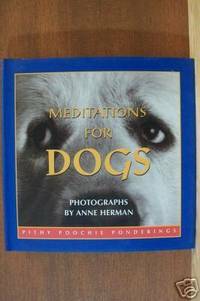 * Do you get frustrated when your dog won't obey you? * Do you ever wonder if you could be doing more to keep your dog healthy? If you've answered yes to any of these questions, don't worry. There is no such thing as the perfect owner -- or the perfect dog. When things go wrong with your pet, all you need is a little love, a lot of patience, and the right information. 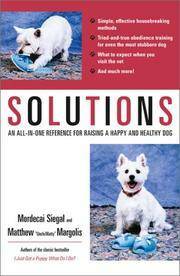 In this practical resource, expert pet writers Mordecai Siegal and Matthew Margolis offer simple, effective solutions for many of the problems that crop up when caring for a dog.... (300-osl? ) . Dial Press. Very Good in Very Good dust jacket. 1998. First Edition; Second Printing. Hardcover. 0385316984 . Ex-library with usual type markings, good reading copy. Internal pages very good. Cover shows light wear & scuffing, a little soiling to outer edges. (400noto) ; 8vo 8" - 9" tall . Andrews Mcmeel. Very Good. 1997. First Edition. Softcover. 0836227204 . Ex-library book, still in very good condition. Sturdy laminated cover and usual ex-lib type of markings. Last few pages of book have light wrinkling/very light stain to one edge and minor spotting outer edge of pages - otherwise clean and intact. B/w & colour photos. "Saving a family of seven from dying in a fire, dragging a handicapped woman from a truck before it exploded, and saving one's own pups from being buried alive are only a few of the amazing stories presented in a book about dogs who have becomes heroes in their own right. " (440os) ; 8vo; 176 pages . Hyperion. New in New dust jacket. 2002. First Edition. Hardcover. 0786868082 . New book, no markings. Dustjacket has light shelfwear involving scuffing to jacket and two tiny edge tears, price sticker on rear. ; 8vo 8" - 9" tall; Modern medicine is now discovering the amazing power of animals to detect, treat, and cure a host of diseases and conditions. There are pets who can sniff out cancers that are undetectable to highly trained doctors with sophisticated medical equipment; others who can sense when their owner is about to have a heart attack, seizure, or panic attack; and many who provide a safe passage in the world for the physically or emotionally challenged. Increasingly, medicine is recognizing the special relationship between pets and people as one of the most powerful weapons in fighting disease and treating chronic conditions. In fact, many doctors are routinely "prescribing" pets for their patients. 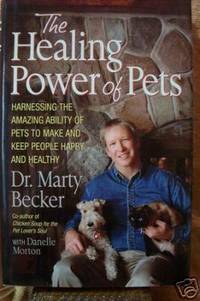 In The Healing Power of Pets, Dr. Marty Becker, Good Morning America's veterinary correspondent, blends revolutionary scientific discoveries with deeply moving, personal stories of pets and their owners.  .
Warner Books. Very Good in Very Good dust jacket. 1997. First Edition. Hardcover. 0446521507 . Only light wear overall. Publisher's reminder mark on bottom edge of pages. Small inscription on blank endpages. Book otherwise clean & unmarked. 233 pages. 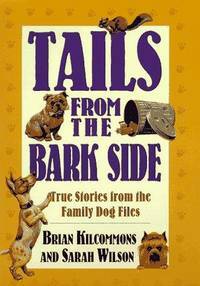 Book Description: In a book as warm and wonderful as James Herriots Yorkshire Tales, but set in the real world of todays pet owners, number one canine experts Briam Kilcommins and Sarah Wilson share their adventures in dog training as well as memories of their own dogs. From one Siberian Husky trying to make it in the Bahamas to the seven Akitas residing in an Italian villa, youll meet some unforgettable pooches in this unforgettable book. (*Shipping will be reduced to some locations). ; 8vo . Andrews Mcmeel Pub. New in New dust jacket. 2001. First Edition. Hardcover. 0740719157 . New book, light scuffing to jacket. 14x14 cm. Photographer Anne Herman captures adorable canines during the moments we appreciate them most: when they're just being themselves. Black-and-white duotone photographs are paired whimsically with quotations by such diverse names as Confucius, Mahatma Gandhi, Fran Lebowitz, and Emo Philips.... [165-osl]; 12mo - over 6¾" - 7¾" Tall .